Santa’s elves, Flip and Twip, are sent to help Mrs. Santa with her last-minute preparations for Christmas Eve. 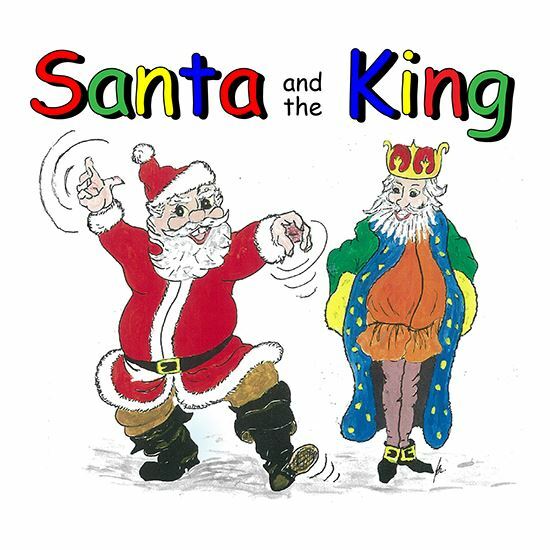 The two elves spin mischief, but real trouble arrives in the form of King Sarak and his spoiled son, Prince Horace. By royal decree, Horace’s Christmas stocking must include all the toys in the land! When Santa refuses, offering instead to visit Prince Horace in the usual manner, the King has the toys seized, thus jeopardizing the merriment of Christmas. With Mrs. Santa’s guidance, plus cooperation between Flip and Twip, as well as lots of audience involvement, the fulfillment of her Christmas wish takes place. Inside the palace where the toys have been taken, Goldenrene, the magic doll, comes to life. Her charm is such that the King has a change of heart. His newfound royal generosity is so great as to promise a Christmas more joyful than ever. Includes original songs and four traditional songs, and the audience is even invited to sing along for one of them. About an hour. Q: WHAT'S YOUR FAVORITE PART OR LINE IN THE MUSICAL? WHY? A: My favorite part of “Santa and the King” is when Goldenrene, the magic doll, comes to life with the music “Awakening of the Magic Doll.” This part of the play is so magical and has such a wonderful effect on the children in the audience. It also seemed such a perfect opportunity to include my variations on Matteo Carcassi’s guitar theme which seemed almost made for a doll walking around the stage. In all our ten musicals, I have never included any theme that wasn’t totally mine, but in this case, Carcassi’s simple guitar theme seemed too perfect to even want to write a new one. All it needed were my additional variations on that very theme to create a perfect background theme for the doll on stage. A: The main thing with this musical (as with all Novelli/Aaron shows) is to create such a nice show for children as to influence them to become avid theatre-goers as adults.